Jake Lamotta: The Richard Nixon of the boxing world! Raging Bull is a look at a portion of former Middleweight champ Jake LaMotta's life from 1941 to the end of his career. It's the story of a man who has endless ability and confidence inside the ring, but is so insecure and paranoid outside of it that he drives anyone who ever cared about him away. He goes from being a champion with the world at his fingertips to an ex-convict who has to emcee at strip clubs to make ends meet. Robert DeNiro plays Jake LaMotta, with Joe Pesci as brother Joe LaMotta, and newcomer-at-the-time Cathy Moriarity playing wife Vickie. All 3 were recognized for their performances by the Academy, with DeNiro winning the Oscar for Best Actor. Director Martin Scorsese was also nominated as Best Director, and the film received a slew of other nominations. There's no disputing the critical acclaim this movie received at the time. Many point to it as the best boxing movie ever made. The grittiness and artistry of the fight scenes (which only take up a total of maybe 15 to 20 minutes of this 2 hour plus movie) are as beloved as the intensity of the characters portrayed. It's hard to believe that Jake LaMotta himself would be so involved in this movie based on his book, "Raging Bull: My Story"; the movie paints such an unflattering picture of him. I haven't read the book, but if he's as unflinching in his criticism of himself as the movie is, then he's a man with some serious perspective. I don't know anyone with that would be willing to display their shortcomings as starkly. I hadn't watched this movie in quite some time. Probably close to 10 years. It's something I can remember loving in high school and college, as much for the beautifully captured boxing action as for the performances. But it's nearly impossible to go into the movie without some notion of what to expect, even if you've never seen it before. It's what I call, "The Goodfellas Effect". Three of the main components of the movie "Goodfellas" came together in this film for the first time. DeNiro, Pesci, and Scorsese all had varying degrees of success in the movie business before this, but their work in "Goodfellas" became the standard by which so many judge their other performances. This is especially true for younger viewers who've seen "Goodfellas" first and then have gone on from there. They remember the combination of humor and fury that DeNiro and Pesci displayed as Jimmy Conway and Tommy DeVito, as well as the fantastic visual storytelling by Scorsese, and they want more. But the truth is, those were once in a lifetime performances by this trio. I don't mean that they haven't been as good before or since (in fact, I enjoyed DeNiro and Scorsese's efforts in "Taxi Driver" and "Mean Streets" just as much as I did in "Goodfellas"); it's just that those performances, if replicated, would become parodies of the original, not equals. This is proved by the comedic turns of DeNiro and Pesci in "Analyze This" and "My Cousin Vinnie", respectively. They took their characters from "Goodfellas" and tweaked them, amplified them, and made them into cartoonish versions of the originals. That's why "Raging Bull" might be a disappointment to some first time viewers. You're not getting the frightening but funny versions of Pesci and DeNiro here; you're getting a much more focused and human look at a man, LaMotta, who is so self-destructive that he lets it all slip away. DeNiro is fantastic in his role, as moving as he is explosive. But I really have to say that I enjoyed Pesci and Cathy Moriarity's performances even more. Both were more understated than DeNiro, but I thought that they captured the exasperation that a brother and wife would feel for a loved one who was so caustic. It's an emotional movie that lingers more on the bad times than the good. You should be prepared for that, especially if you're expecting, "But, I'm funny how? Funny like a clown? I amuse you? I make you laugh? I'm here to f@#kin' amuse you?" It's just not gonna happen. A truly beautiful film, in regards to the boxing action. Instead of making the mistake of trying to "put the viewer IN the action", Scorsese molds the boxing action into a cinematic vision. It doesn't look completely realistic because it isn't supposed to be completely realistic. He takes artistic license in the presentation of the action, but it isn't heavy handed. The camera tricks and special effects only ad to the brutality and beauty of the action in the ring. And of course the preparations that DeNiro made before taking on this role are well documented. Not only did he get himself in spectacular shape (and then, just as spectacularly, get himself 60 lbs. out of shape in order to play the "washed-up" LaMotta later in life), but he even entered some real life boxing matches. It was well worth the effort, as he's fantastic in the ring. 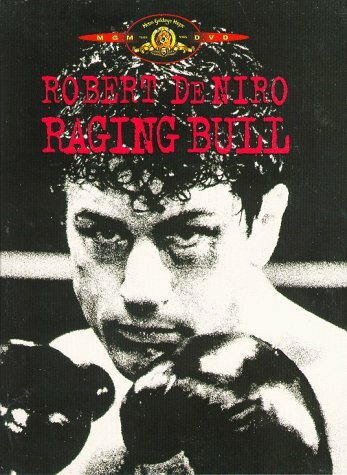 When you watch a movie like Raging Bull for the first time, a movie that has received so much critical acclaim and is thought by some to be THE definitive boxing movie, it�s hard NOT to go in with preconceived notions. The Oscar nominations, DeNiro, Pesci, Scorsese; it�s all very persuasive. Honestly, I think the movie has suffered a bit as the years have passed. It�s odd that a period piece like this wouldn�t �age well�, but I think it has more to do with the accumulated works of it�s participants than with any anachronisms captured on film.